Mobile search is driving billions of new revenue every year. According to comScore, Smartphones have surpassed 125 million U.S. consumers and tablets are now owned by more than 50 million. 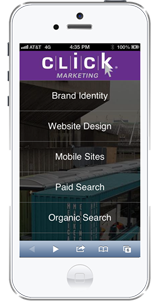 When hitting the mobile marketing gas pedal, it is critical to have a well branded and easy to navigate mobile site. How can Click Marketing help you with Mobile Site Design? Click Marketing combines the talent of brand design, technology, and strategy to produce mobile optimized sites that drive results. Each project focuses on business objects and high quality design.